Today, the Tour de France will once again climb Mont Ventoux, one of its more famous climbs. Once upon a time, I climbed the mountain as well and I wrote the following about my experience. This is the second of three installments. The Part One can be found HERE. I was alone, still in the wooded part of the climb. There were flies about the size of my son’s fist flying in my face, biting my arms, legs, and other portions of the body that I will not mention. It was next to impossible to shoo them away since a) I was not moving all that fast and b) if I took one of my hands off the handle bars for even a second, I risked losing control and crashing violently off the side of the mountain. So I tried to reason with the flies. I tried to reason with flies. Yes, I might have already been delirious. At least it was not that hot. I could not even begin to think about what it is like in July when it probably approaches 100 degrees. I then glance down at my heart rate monitor and realize that I am quickly approaching Mayo’s time of 54 minutes. Too bad I still have about 8k to go. I also know that the climb is as steep as cow doo-doo, since along the way there are what the French call “bornes” — sort of mile markers. Usually, they tell you how far you have gone from the last town or how far you have to go until the next town. Instead of giving you useful info like how many more kilometers of suffering you have left, it tells you the grade. That right, it tells you the friggin’ grade. At one point, it “leveled out” at 8% for 500 meters. Phew. I needed the rest. I figured since I was in France (I think), I might as well question my existence too (a shout out to the Sartre lovers in the crowd). I was rather sure I existed, but without others to prove it, I was not quite sure. Well, the two behind me were catching me, and fast. They caught me with 6k to go, right past Chalet Reynard (a small café) and right where the trees stop, the “lunar” landscape begins, and the grade hits 11 or 12%. And there was now wind. Wind might be a misnomer. Perhaps typhoon is more appropriate. Without any trees, there is nothing to stop the wind. The temperature had already dropped about 15 degrees, Fahrenheit or maybe it was Celsius, who gives a crap, it was a lot colder. I am still not quite sure why I said that. I was starving. And I was far from OK. I was starving. Did I mention that I was rather hungry? But when food was offered, I declined, of course. Why? Starving. I think I was at the point of nearly passing out. But I said I was “OK” with food and water. 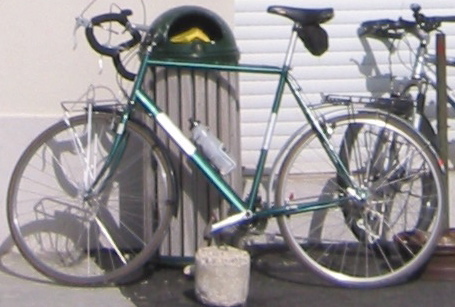 The bike I rode up the Ventoux. Check out the nice fenders, the suicide brakes and the luggage racks. Epitome of style. If only it had a kickstand and a bell…. What a dope. I mean it, a total moron. I should return my Ph.D. based on my asinine response to that simple question. I was so hungry, at some point I saw a guy on the side of the road eating a granola bar. As I approached, I considered all of the ways I could get that speck of bird food away from him. Ask politely: “Excuse me sir, but I am a pathetically stupid excuse for a human being and I forgot to bring ANY food on this beast of a climb. Could you take an extreme amount of pity on my sorry white carcass and give me that last scrap of food you are about to ingest?” Or I could steal it, after all, how tough could he be? But I figured he was French, in which case he would have thrown his arms in the air so fast to surrender, the granola would more than likely been thrown over the cliff. Given my recent bouts with stupidity, I likely would have dove after it. I could have snatched it out of his hand as I rode by, but he would have had time to wipe his mouth, take a drink of water, stretch, yawn, pee, and take a brief nap before calmly walking after me, pushing me over and taking his food back. Did I mention I was not moving very quickly? So I simply looked longingly at the scrap of dried oats and whey glued together with a speck of honey as I pressed along. I had traveled 57 kilometers of the original 22, leaving me another 48 kilometers to go; I weighed 128 kilograms (or 432 pounds) and my bike weighed 987 pounds (or 1267 kilos); the wind was blowing at about 345 k per hour, making it a category 12 hurricane. 5.5 kilometers to the top. This entry was posted in Cycling, Humor. Bookmark the permalink. Very funny. The trip back down must have been a scream! The trip back down was rather uneventful, honestly. It was a lot of fun and very fast. Over in a heart beat…. This is laugh-out-loud hilarious! I really enjoyed it, especially the math. Thanks! I certainly had fun writing it, but not riding it (say that out loud to someone if you want to sound contradictory). I’m loving this story. But the conclusion isn’t showing up – there’s an error page. It’s making for a cliffhanger.